Mike already has the right side heater in position. The heated grips wires and power wires have been snaked through the handlebars and bars have been drilled to accommodate the heater switch and switch wires. With the right side heater wires and the power wires (power and ground) all routed and exiting the left side handlebar, route the four switch wires through the rubber grommet and out through the left side handlebar. Now, with all of the wiring exiting the left side handlebar, reference the wiring diagram and gather any connectors from the kit. You will now join: Two red wires. Two green wires. Three yellow wires. Three white wires and three black wires. The supplied connectors work very well, but if you prefer to solder your connections and cover with shrink tube, that is perfectly acceptable as long as the work is neat and secure. Tuck all wiring and connections into the left side heater and carefully slide the unit into the handlebar end. The job is almost complete, but before beginning to put things back together, it is important to stop and test your work. Verify that all heated grips settings are functioning correctly. It should not take more than five minutes before the heated grips are good and hot inside the bars. The handlebars will be hot to the touch without the grips being installed. Reassemble the left side grip, switch housing, and clutch perch. 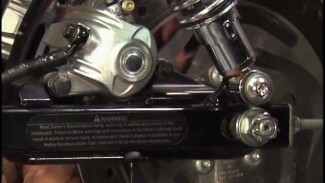 It is important that the new clutch perch clamp is not overnighted. 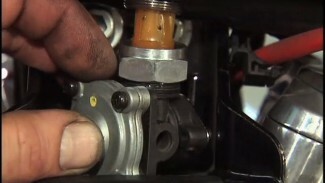 Reassemble the right side hand grip, switch housing, and front master cylinder. Don’t forget to plug the twist grip sensor back in, if you have not already. The easiest, most accessible way to power the heated grips is with the open accessory wires that are typically accessible near the headlamp plug. However, there are many different ways that an accessory like this can be powered. Do what works best for you and your ride but make sure that you are not trying to pull power from a source that will adversely affect another electrical component such as your ignition/ECM, or turn signal security module.